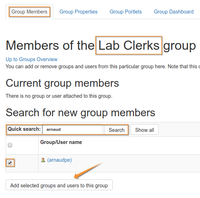 the users list is displayed, click add for new user, or on an existing user to edit him/her. 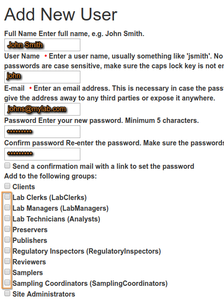 The LIMS can be configured to allow the administrator to set the user's first password, please provide one. Alternatively the system will generate a password. Alternatively, click on the groups tab. 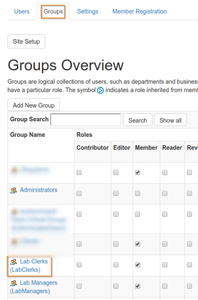 This will display a table of all the groups in the system and the roles assigned to them. Client users, 'Client Contacts' have more options to manage, e.g. results publication preferences. These are maintained in their folders in the client organisation structure, please see Client Contacts.